Kennesaw, GA (January 2017) – We’re craving warming weather after hearing Vibe has announced their Spring 2017 product launches! Along with the long awaited 2017 Sea Ghost 130, Vibe is also introducing two brand new vessels; the Vibe Sea Ghost 110, the newest addition to Vibe’s Sea Ghost series, and the Maverick 120 SUP. Although you can’t visually see most of the updates on the 2017 Vibe Sea Ghost 130, you will feel them. “We were really just focused on improving an already awesome kayak! 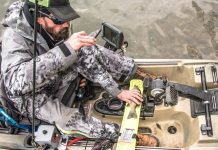 Our goal was to listen to the feedback from customers and deliver them the product they desire,” explained Josh Thomas, co-owner and designer for Vibe Kayaks. That feedback led Vibe to give more structure to the sidewalls of the foot braces, adding thicker rudder cords to prevent cleat stripping, raising the floor beneath the seat for a dryer ride, adjusting the pitch of the seat for a more level ride, tweaking the angle of the flush mount rod holders for better rod placement, and adding pitch to the rear tank well for better draining. These small changes add up to big improvements on the 2017 Sea Ghost 130. Much like its predecessor, the Vibe Sea Ghost 110 is packed with features that kayak anglers demand; including the adjustable Hero Seat for all-day comfort, integrated gear tracks for easy customization and a toe-controlled rudder system that saves paddler’s energy on long paddles and rough currents. 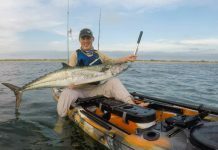 “We wanted to deliver a kayak with all the same features that anglers are looking for, along with superior stability and maneuverability. 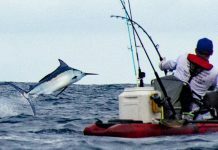 The Sea Ghost 110 was really designed for the anglers that love the rivers, lakes and tight quarters,” explained Josh Thomas. The Vibe Sea Ghost 110 Kayak Angler package, retailing for $829 (including Vibe Journey Paddle) will be rolling out at Vibe dealers in Spring 2017. 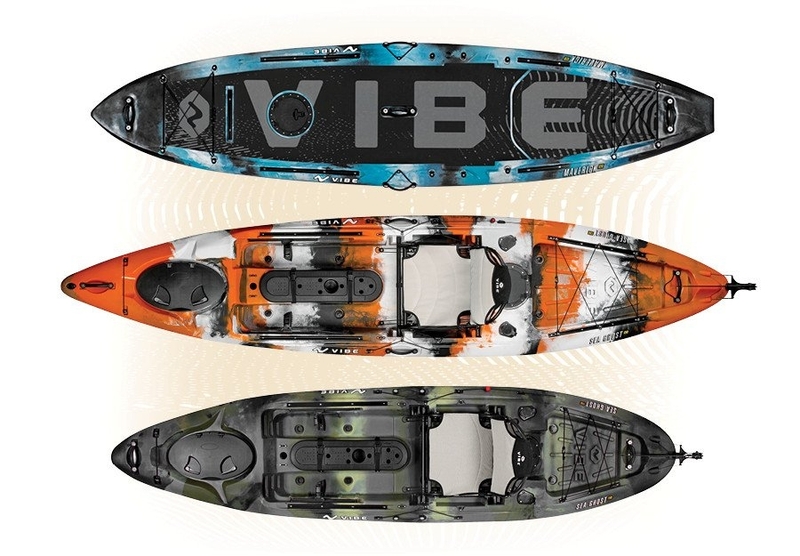 Last, but certainly not least, the Vibe Maverick 120 SUP is Vibe’s entrance into the growing popularity of SUP angling. Utilizing a pressure-injected foam hull with a rotomolded polyethene shell, the Vibe Maverick 120 SUP offers a sink-proof, no-flex deck! This technology also results in a lightweight board, weighing in at 56 lbs with a superior weight capacity of 475 lbs. Always with the angler in mind, the Maverick 120 includes 5 integrated gear tracks, front and rear bungee systems, an 8” sealed hatch and multiple paddle parks. “We really wanted to improve on the current rotomolded boards out on the market. Utilizing the technology of a foam-injected hull gives users an SUP with no flex, bowing, or drooping of the board. 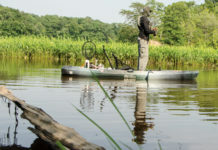 Our heart and passion is in kayak fishing, but including an SUP in our product lineup gives the Vibe brand the versatility to reach those customers that are just looking to get out on the water and enjoy the outdoors,” said Josh Thomas. The Vibe Maverick 120 SUP package, retailing for $879 (including Vibe Roamer SUP Paddle) will be rolling out at Vibe dealers in Spring 2017. About the Company: ​Vibe is a kayak company founded by avid fishermen and kayakers from Atlanta, GA, who love the water, its inhabitants and everything associated with being in the outdoors. We’re committed to serving our community of fellow outdoor and watersports enthusiasts by providing them with the best kayaks and accessories. Our kayaks are designed to give paddlers of any skill level the opportunity to experience freedom, the outdoors and fishing in a whole new way. Get outside and experience the good vibes mother nature has waiting for you!